Pallets play a huge role in the handling industry and are used throughout the supply chain in warehouses and for transportation. There are many benefits to choosing wooden pallets for commercial warehouses – namely their environmentally friendly properties. 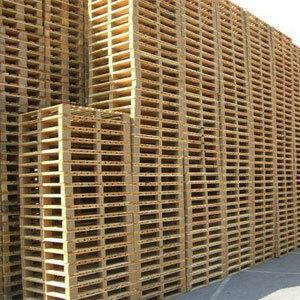 Pallets (or “skids” as they were originally known) made from timber were first introduced in the 1920s and became widely used in the 1940s, playing a significant role in material handling in this modern era. Here are a few reasons why you might consider using timber pallets to transport and store your stock, and what other alternatives are out there. Contrary to popular belief, the production of wooden pallets does not result in deforestation. In fact, pallets are simply a by-product of the timber used in the house construction industry and by furniture makers. The best wood is reserved for use on these high-end products, and the humble timber pallets are then created from the off-cuts. Wood is a widely recycled material, which means that pallets made from wood are equally recyclable items. Wooden materials, including pallets, can be transformed into a range of creative items that won’t harm the environment. For example, pallets can become storage items, beds, seating, coffee tables and much much more. These crates are anything but a waste of space and wood. It is very rare for pallets to be dumped. In fact, research has shown that less than 5% of pallets are sent to landfill sites, which means that at least 95% of the timber is being put to good use, and those that do come to the end of their lives on a landfill or a similar dumping ground will eventually biodegrade. Not only can timber pallets be re-used for domestic purposes, but they can also be chipped into a sustainable fuel and be re-sold commercially. Any waste from packaging made from wood can be used to make more pallets, and the rest is useful as fuel. This wood fuel includes firewood, charcoal, wood chips, wooden sheets and sawdust. Wood fuel remains the main energy source in developing countries, and if it is managed sensitively, this type of fuel can be a renewable energy source that doesn’t harm the planet. Although traditional timber pallets currently dominate the commercial market, various types of eco pallets have become increasingly popular. These eco-friendly crates are made from plastic and are lightweight, strong, safe and hygienic. Plastic pallets don’t need to be fumigated in the way wooden ones do, and they are designed to last longer. In recent years, plastic pallets have also become more biodegradable, though they are not as recyclable as the traditional timber pallet.